The big danger to the stock market is lurking in a chart that most investors are ignoring. • Yes, we all eat food and use energy. The reason for excluding food and energy is that they are volatile and make it difficult to make reasonable projections. • Please note from the chart that core PPI has moved up from under 2.5% to over 4.5%. Important: Using the absolute change instead of percentage change — the figure that’s widely reported — makes the trend on the chart easier to read. • Please note that core PPI has broken out of a range and the trend is up. 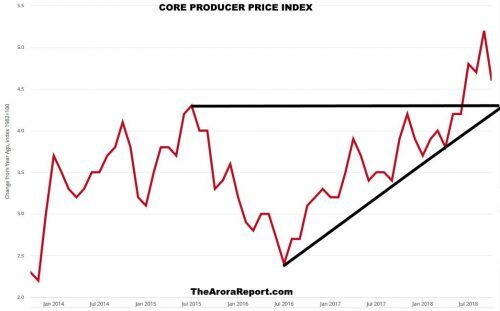 • The reason this chart is being ignored is that, for a while, producers have been absorbing the higher costs and have not been passing them on to consumers. That cannot last forever. Soon, PPI will show up in the Consumer Price Index (CPI), a key gauge for the Federal Reserve in determining interest rates. • Higher inflation will result in higher interest rates. Many investors, especially passive investors, stay comfortable by looking only at the Dow Jones Industrial Average DJIA and broad-based ETFs such as S&P500 ETF SPY, Nasdaq 100 ETF QQQ and small-cap ETF IWM. Many investors also believe inflation won’t hurt their favorite tech stocks, such as Apple AAPL, Facebook FB and Google GOOG, GOOGL. Nothing could be further from the truth. Smaller, but popular, stocks such as Etsy ETSY, ANGI Homeservices ANGI and Trade Desk TTD can also feel pain. Astute investors ought to keep an eye on the core Producer Price Index and also consider using a sophisticated model as opposed to just looking at the prices of the indices and popular stocks….Read more at MarketWatch.